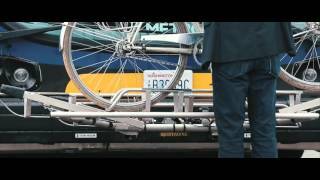 The Apex 3™ transit bike rack sets a new standard for safety and performance in transit bike racks. The frame, wheel trays, and support arms have been completely redesigned to reduce bounce, and minimize the rack's footprint for better vehicle turn radius, headlight/turn signal visibility and improved safety. All Sportworks bumper-mounted bike racks require a Pivot Plate, Brackets and Bolt Kit for proper installation. The Apex Pivot Plate measures 20” wide, and provides the mounting and pivot point exclusively for Sportworks Apex Series bike racks. The pivot plate is connected to bumper brackets, and enables the bike rack to move between the stowed and deployed positions. The Apex Pivot Plate includes a single torsion spring to reduce the racks lifting weight (optional second spring available) and is powdercoated black. Sportworks offers two primary types of Brackets that secure the Pivot Plate and Bike Rack to a vehicle bumper. The Stand-Off is the most common bracket type, and attaches through holes drilled into the front of the vehicle bumper. Stand-Off brackets are available in a variety of lengths, and do not require removal of the bumper for installation. The following information may be required to determine the proper fit for your vehicle: vehicle make and model, vehicle year, bumper manufacturer and type. The C-Bracket fits around the bumper by attaching to the frame, and alleviates the need to drill holes through the front of the vehicle bumper. C-Brackets come in a variety of sizes, and require removal of the bumper for installation. The following information may be required to determine the proper fit for your vehicle: vehicle make and model, vehicle year, bumper manufacturer and type. Sportworks Transit Racks - Quick, Easy and Intuitive! Approaching from the curbside, the rider lowers the rack with one hand while supporting the bike with the other hand. This durable rack is as easy to raise as it is to lower. After lowering the rack, the rider places the bike into one of the rack’s open wheel trays. All bike positions are completely independent of each other, making it easy to load or unload bikes with others already loaded in the rack. To secure the bike, simply pull the unique self-storing support arm out and over the front tire. The handle should be placed as close to the front brake and head tube as possible to ensure safety and security of the bike, and in all cases the handle must be closer to the head tube than the highest point of the tire. Is the Apex 3 safe to use on smaller transit vehicles like cutaways? Measuring 82” wide, the Apex 3 offers the most compact, maneuverable, and unobstructed layout of any 3-position bike rack available today. One of the key design objectives was to create a highly-compact footprint that provides minimal impact on vehicle turn-radius and headlight/turn signal interference. Sportworks recommends using the Apex 3™ on any transit vehicles* measuring at least 96” wide (excluding mirrors). Online vehicle data suggests that most cutaways measure 96” in width. For more information about the width of your vehicles, please contact the OEM vehicle manufacturer or reseller directly. *NOTE: Excluding Chevrolet 4500 and 5500 vehicles. Why is the Apex 3 not recommended for use on Chevrolet 4500 and 5500 series vehicles? The C4500 and C5500 are extremely harsh vehicle platforms with lots of vibration and stiff suspension. As a result, we believe these vehicles may cause premature wear and failure of critical weld points on some 3-position bike racks. We are conducting tests to determine if the C4500 and C5500 are safe and sustainable platforms for the Apex 3 rack. How far does the Apex 3 extend from the front of a bus? When deployed, the Apex 3 measures 32” in length from the front of the rack to the back of the pivot tabs. The Apex pivot plate and bumper brackets (mounting hardware) will increase the 32” length when these components are combined with the rack. Ultimately, the total length depends on the type and length of bumper brackets installed, and may vary from vehicle to vehicle. The only way to obtain an exact measurement is to install a test/sample Apex 3 rack on the intended vehicle type, and measure it. Are any transit agencies in California using the Apex 3? Yes. Since launching the rack in June of 2012, hundreds of Apex 3 racks have been shipped to more than 70 customers nationwide. Of those, approximately 15 customers reside within the State of California. Upon special request and consideration, Sportworks may provide a complete list of Apex 3 customers. If you feel this information is critical to getting the Apex 3 approved for use in your area, please contact us at (425) 483-7000 or salesandsupport@sportworks.com to request more information. Does the Apex 3 comply with California Vehicle Code 35400 which includes a 36” maximum length requirement? In reviewing CA Vehicle Code 35400 http://www.dot.ca.gov/hq/traffops/trucks/trucksize/length.htm it is unclear how the Apex 3 will be perceived by CHP. There are a number of variables to consider here, and Sportworks is not in a position to provide legal advice. If you are concerned about compliance with 35400, we encourage you to contact the California DOT for an official interpretation. Some customers have told us that by shortening the bumper brackets they’ve been successful getting the Apex 3 to meet the current 36” requirement. While Sportworks does not recommend doing this, we realize that some customers will do anything they can to accommodate more bikes on buses. NOTE: Doing this will reduced the amount of clearance between the bicycle closest to the bus and the vehicle windshield, and may require a change to your Bike on Bus (BOB) program that prohibits bicycles “except road bikes with 44cm (17.5”) or narrower handlebars” from being loaded into the inner most tray. Is it necessary to seek and obtain approval from the Highway Patrol or Department of Transportation (DOT) to use the Apex 3 in California? What we’ve found is that some customers are not concerned about approval, and have decided the Apex 3 provides the safest layout of any 3-position rack available. Other customers have successfully received approval by working with the CHP, while others have been advised it violates the current 36” length requirement. What’s important to understand is that most customers are getting different answers from different CHP officers. Some say it’s OK, while others believe it violates California code. If approval is a concern, the first step to getting the Apex 3 approved is to install a sample rack on the intended vehicle, then contact the CHP to come out and review it. If for any reason the initial officer feels it does not comply with California code, we recommend getting a second opinion from a different officer or the DOT directly. Have any California customers received approval to use the Apex 3? Unfortunately, we cannot provide any details about the specific approval process each of these agencies went through, but they did tell us the process involved installing a sample rack and having the CHP review. If you have questions about the approval process we encourage you to contact these agencies directly. What are the best ways to get the Apex 3 and similar 3-position racks approved for use in California? What is the process to request verbal and/or written approval to use the Apex 3 in California? Considered the most efficient method of all, there is no specific process to follow with this approach. What most customers do is obtain a sample Apex 3 from Sportworks, install it on the intended vehicle, and then contact the CHP to schedule a safety review. Due to the inconsistency of CHP approvals mentioned above, it may be necessary to obtain a second opinion, or bypass this method altogether. What is the process to request an EXEMPTION to use the Apex 3 in California? Sportworks has created a letter template entitled “CA Equipment Review & Exemption Request” that can be sent to the California DOT. It contains all relevant historical information about bike racks on buses, as well as CAD layouts of the Apex 3 installed on a vehicle. Upon request, we can send you a copy of this letter in Word format. Please send your requests to: salesandsupport@sportworks.com. What is the process to request a PERMIT to use the Apex 3 in California? To request a State of California DOT permit you can download the application and checklist here: http://www.dot.ca.gov/hq/traffops/permits/pdf_documents/policy/excreqchk.pdf. Upon request, Sportworks can provide documentation with all relevant Apex 3 measurements (equipment component dimensions) mentioned in the checklist. Note: The equipment component dimensions are required as part of your submitted materials. Have any California customers been successful in obtaining an EXEMPTION, PERMIT, or passing a bill to use bike racks that exceed the current 36” length requirement stated in VC Section 35400? Alameda-Contra Costa Transit District (AC Transit) – AC Transit’s work with the DOT and government officials resulted in CA Vehicle Code Section 35400.7. Under this arrangement, AC Transit is allowed to use bike racks that extend up to 40” from the front of the bus, and must submit a report by December 31st 2014 that includes (among many things) a summary of the mobility improvements the longer bike racks provided. For details about 35400.7 visit: http://www.dmv.ca.gov/pubs/vctop/d15/vc35400_7.htm. Gold Coast Transit (GCT) – GCT’s recent efforts resulted in Assembly Bill No. 2488 and subsequent CA Vehicle Code Section 35400.9. which authorizes GCT to install bike racks that extend no more than 40” from the front of the bus when deployed. Visit: http://www.leginfo.ca.gov/pub/11-12/bill/asm/ab2451-2500/ab2488bill20120919_chaptered.pdf. What else is being done to change California VC Section 35400 to accommodate larger 3-bike racks? Accommodate bikes with extra wide tires, commonly known as fat bikes, with the Fat Tire Bike Trays and Support Arms for the Apex 2 and Apex 3 transit bike racks. The first and only way to automatically count bikes on your buses. The Ten Second Bracket™ (TSB) is an integrated pivot plate and bracket assembly that allows fast and easy removal of Sportworks front bumper-mounted bike racks for towing and maintenance. Increase revenue with our integrated ad panel designed to fit our transit racks. Prices may vary according to configuration. Sportworks designs and fabricates all products in the U.S. Our employees are passionate about producing exceptionally high quality and cost efficient products. All Sportworks products are manufactured using state-of-the-art technology, and proudly fabricated in America.